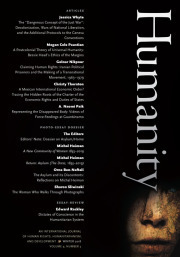 Abstract: This paper asks, what might it mean to take seriously the claim that human rights processes are a form of ritual? It does so through an ethnographic analysis of the work of the UN Committee Against Torture. The apparent self-referentiality of human rights regimes has led some critics to argue that they have become an increasingly calcified process. This paper argues though that the formal ritual of the UN human rights monitoring process can create space for the moral imagination. More specifically, the rituals of human rights can create an “as if” of commitment to human rights, which takes shape despite, or even because of the problems and absences in existing practices.